I start so many lists of and for food: to buy groceries, as a reminder to try a recipe, for planning parties. But I don’t keep track of the other end so well—what actually happened, what we actually ate, if we’d do it again. I realize that this is because I always think I’ll do it later. That when I start a new list, it will be a chance to reflect on the old list. The reality is these are two separate exercises/experiences: planning and reflecting—and they should be treated separately. I was making a mistake in trying to put them together, and so giving short shrift to both. In forgetting to reflect, actively, on what was good or bad I, wasn’t leveraging my lessons learned to their full potential. Skipping a step, missing an opportunity for a different sort of experience. So in trying to honor the Zen of cooking, here’s what we actually ate. And as I type this, I’m thinking of how uninspired I felt about meal planning last night—and I’m hopeful this will help. Sunday: Veal Meatballs, Cucumber Raita, Chard + Chickpeas. A little tour of the Mediterranean in one meal. Porchetta w/potatoes, onions and apples. The “porchetta” was a pork shoulder roast from Marin Sun Farms, cooked according to the Zuni Café cookbook recipe for Mock Porchetta. This was our second time cooking out of the meat box, and it was the best Porchetta we’ve ever made at home. Parmesan Cornmeal Savory Pancakes that I read about on Eat Make Read. These were delicious and we will definitely be making them again. Could have used a little more parmesan. The salad was some little gems leftover from last week’s box. Still delicious and the perfect counter-point to the above richness. The box was late coming—it comes on Tuesdays—it actually didn’t arrive at our home until after I did...at about 7 pm. We got half the amount of rhubarb, promised, too. The pasta was good, but not as delicious as it will be later In the summer, when the zucchini available are smaller and more sun-soaked… and when the basil I have isn’t half dead from being in the fridge. This is one of my favorite summer pasta dishes, and we’ll have it all many times over the months to come, I’m sure. Since we still have a drawer full of citrus (or actually, we added to it with the 4 grapefruits in this box), I tried to make a grapefruit soufflé. I have a vague memory of an orange soufflé at maybe Gary Danko (except I also remember it advertised as a “dieter’s delight of a desert” which doesn’t sound very Danko-esque, dot.bomb or no), a lemon soufflé somewhere on the Amalfi coast… and I have too many grapefruit. I used the Chez Panisse Desserts recipe for tangerine soufflé, substituting grapefruit juice simple syrup for the sugar and a combination of grapefruit and orange peel for the tangerine peel, and a combination of gran marnier and grapefruit juice for the gran marnier. It was horrible, like, as M put it, orange scrambled eggs. I make really good savory soufflés, and often. And a good chocolate soufflé, occasionally, so this is not an issue of technique. Of course M ate all of it (Marin Sun Farms eggs don’t go to waste in our house, even with the CSA discount), while reminding me that the Desert cookbook is only good for ideas, not execution (he’s right). After that I did some internet digging and I think I know what the problem is. And since we still have a surfeit of citrus, I’ll probably try again in a few days. Asparagus flan seemed ridiculously ambitious at 6 pm even though I unexpectedly worked from home. Instead I made this pasta, which we’ve enjoyed (although with slightly tweaked proportions—twice the lemon juice, a little more feta and 2 or 3 times the olive oil) several times before. Turns out we are out of garlic and shallots (who let that happen?!) so I used half a red onion instead, Matt oiled the pan, but not enough, the onion burned, I put too much water in the sauce, the broccoli either didn’t steam long enough or too much, we forgot to add the extra lemon. Despite all that, it was still ok, though not fantastic. J loved it, though, and ate plenty for dinner, and then some more the next day for lunch. I love it when my kid can eat our food, yay! So for that, I rate the dish a success. We have friends in town for a wedding this weekend (one of M’s college roommates live out here, so a mini-reunion), which lead to us realizing we had some unexpected day-time entertaining to do Thursday. Or rather, M did. So, we prepared chicken salad components and lemon bars after dinner… MMmmmm lemon bars. Yum-my. We ate our share. M went to a bachelor party Thursday for the aforementioned wedding, so I was on leftover duty. I had high hopes for the bread pudding (swiss cheese, old bread, chard) leftovers, but was disappointed, and ended up eating cheddar bunnies, grapes, pistachios, and far too many lemon bars. There was also some leftover ice tea from the lunch M hosted… good excuse for more lemon bars! Lemon bars + Iced Tea = perfect snack = proving I am really a southerner at heart. Fortunately the baby vacuum cleaner quite enjoyed the savory bread pudding, so all was not for naught. M was out again for dinner, so I baked the leftover broccoli pasta with ¼ c. olive oil, juice of half a lemon and 1/4 c feta added-- I spread across a shallow, round baking pan with the additions on top. This tasted great. I forgot we’d need lunch on Saturday and didn’t plan well ,but fortunately had plenty of leftovers, plus I made these crackers. 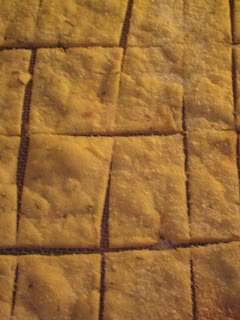 My first time making crackers, and next time I’ll fiddle with the mix-- I think butter would be better than oil (or at least some butter 0adn there was too much cream. For dinner, we were at the wedding. Still stuffed from lunch at Out The Door!